When arguing the pros and cons of any issue, it's usually helpful to have agreed-upon facts on hand. Unfortunately, when it comes to homeschooling, there are very few reliable studies and statistics available. Even something as basic as how many children are being homeschooled in a given year can only be guessed at. Here are a few of the reasons you should take any facts and figures you see regarding homeschooling — good or bad — with a grain of salt. Would you consider all these children homeschoolers? A child enrolled in a virtual public charter school who does all schoolwork at home. A child who spends part of the week in public school classes. A child who homeschooled some years but not others. When it comes to counting heads and drawing conclusions, it's important to compare apples with apples. But since different studies use different definitions of homeschooling, it's hard to know if studies are actually looking at the same group of kids. For instance, a report from the National Center for Education Studies, part of the U.S. Department of Education, includes students who spend up to 25 hours a week — five hours a day — attending classes in a public or private school. It's hard to equate that experience to that of a child who has never sat in a classroom. In the U.S., it is the states that oversee education, including homeschooling. And each state's laws on the matter are different. In some states, parents are free to homeschool without even contacting the local school district. 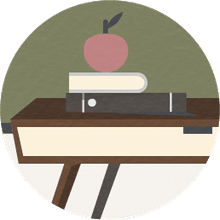 In other states, parents must send a Letter of Intent to homeschool and submit regular paperwork, which can include the scores of standardized tests. But even in states where homeschooling is closely regulated, good numbers are hard to come by. In New York, for example, parents must submit paperwork to the school district — but only for children within the age of compulsory education. Below the age of six, or after age 16, the state stops keeping count. So it's impossible to know from state records how many families choose to homeschool kindergarten, or how many teens go on from homeschooling to college. It's hard to find an article about homeschool in the national media that does not include a quote from the Home School Legal Defense Association. HSLDA is a nonprofit homeschool advocacy group that offers legal representation to members in some cases involving homeschooling. HSLDA also lobbies state and national legislatures to present its conservative Christian viewpoint on issues regarding home education and family rights. So it's fair to question whether HSLDA's studies represent only its constituents and not homeschoolers from other walks of life. Likewise, it seems reasonable to expect that studies by groups in favor of or opposed to homeschooling will reflect those biases. So it's not surprising that the National Home Education Research Institute, an advocacy group, publishes studies that show the benefits of homeschooling. Teachers' groups like the National Education Association on the other hand, often release statements criticizing homeschooling simply on the basis that it does not require parents to be licensed teachers. In 1991, Home Education Magazine ran a column by Larry and Susan Kaseman which advised parents to avoid taking part in studies about homeschooling. They argued that researchers could use their school-based biases to misrepresent the way that homeschooling works. For instance, a question about how many hours are spent teaching implies that parents should be sitting down with their kids doing desk work, and ignores the fact that a lot of learning happens in the course of everyday activities. The HEM article went on to say that academics who conduct studies often come to be regarded as "experts" on homeschooling, by the public and sometimes by homeschooling parents themselves. Their fear was that homeschooling would come to be defined by the measures looked at in the studies. Along with the issues raised by the Kasemans, many homeschooling families don't take part in studies to preserve their privacy. They'd simply rather stay "under the radar," and not risk being judged by people who might disagree with their educational choices. Interestingly, the HEM article came out in favor of case histories. According to the Kasemans, interviewing individual homeschooling families to hear what they have to say about their educational styles is a more effective and accurate way to provide data on what homeschooling is really like. It's easy to say that most homeschooling families are not qualified to educate their own children — if you define "qualified" to mean certified to teach in a public school. But could a medical doctor teach her children anatomy? Of course. Could a published poet teach a homeschool workshop on creative writing? Who better? How about learning bike repair by helping out in a bike shop? The apprenticeship model worked for centuries. Measures of public school "success" like test scores are often meaningless in the real world, as well as in homeschooling. That's why demands that homeschoolers submit to more testing and studies that look at homeschooling through the lens of traditional schooling can miss the true advantages of learning outside a classroom. Here are some links to research on homeschooling, from a variety of sources. Number of Homeschoolers by State: Updated listings by Ann Zeise from A2Z Home's Cool. The International Center for Home Education Research: Formed in 2012, this group says it provides "nonpartisan information about homeschooling." Education Week Homeschooling article: Overview from 2011 with links to related articles and studies. New Nationwide Study Confirms Homeschool Academic Achievement: HSLDA article with links to studies. 1.5 Million Homeschooled Students in the United States in 2007: Article from the National Center for Education Studies. What Have We Learned About Homeschooling? : Article by E. Isenberg from the Peabody Journal of Education, 2007, that discusses the lack of reliable data on homeschooling. Home Schooling in the United States: Trends and Characteristics: Study by K. Bauman published in Education Policy Analysis Archives in 2002, using data from the 1990s.